Get the ultimate Manager™ SE experience with ProPack, a powerful collection of tools to take your auto repair customer communication and management to another level. Our ProPack add-on software helps you increase customer loyalty, communication and satisfaction, as well as providing in-depth reports to give you deeper insights into your customers’ behavior. Project a professional impression with customizable invoices through Report Pro. This ProPack feature gives you control over your message by allowing you to customize your invoice by adding your logo or shop slogan, complete contact information including web address, Facebook and Twitter information, as well as credit card, industry affiliations and much more. Best of all, you can list work performed by job — far more convenient than the old fashioned method of listing parts on one side, labor on the other. As if that wasn’t enough, Report Pro also prints a QR code with your customer’s next scheduled service date and even allows you to include a coupon for a special discount, if you so choose. Impress customers by customizing your technician worksheet with detailed information and service history. And create multi-point inspection worksheets for your customers, showing what was inspected, what recommendations you’re making and when services should be performed. Ever left a voicemail or email message only to have your customer see it too late? Take your auto repair customer engagement to the next level and send text messages directly from Manager SE to your customer’s mobile phone. This ProPack feature allows your customers the opportunity to see that important message from you in time to act on it. Just choose your customer and a canned message, or type your own message and click send – no need to look up phone numbers or dial manually. Lube stickers have been around forever – and Lube Sticker Pro is the next generation designed specifically for use with ProPack. 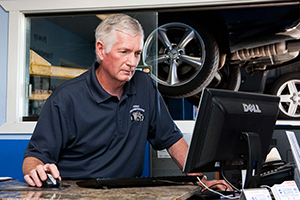 Set your interval and lube type and the system prints a windshield sticker, accurately predicts when the customer should return, automatically schedules the next service appointment, and generates a recommendation for the vehicle. ProPack’s Lube Sticker Pro feature even sends a text message reminder to your customer to make sure they don’t miss their next appointment.